Want a more youthful vibrant expression? Forget expensive cosmetic wrinkle fillers and injectables like Botox. 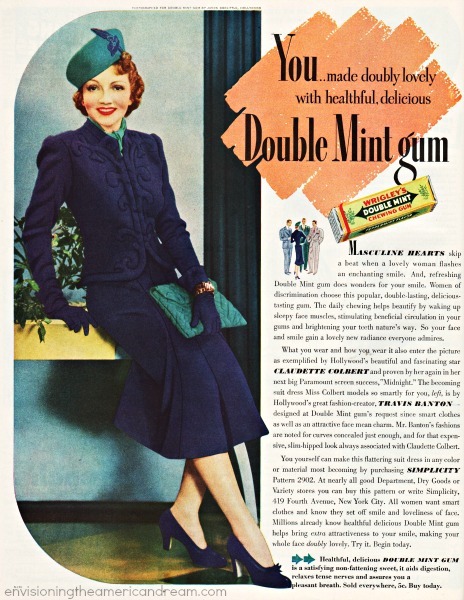 For a true non surgical age reversing technique-good ol’ American chewing gum not only doubles your pleasure, but makes you doubly delightful to look at too! And this advise comes straight from one of retro Hollywood’s loveliest stars Miss Claudette Colbert! Looking renewed and refreshed, admiring friends will wonder whether it was a new hair-do or a relaxing cruise that contributed to your radiant countenance. Who would ever guess it was a mere stick of gum. 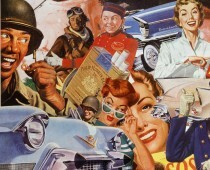 The ad doubles the sales pitch as well by hawking Claudette Colbert’s next big movie and a Hollywood fashion designer.